This sounds like one I might like, although I think switching focus in the middle of a novel would irritate me. I also tend to zone out when authors discuss religion, whether for or against. I don’t remember this book except that the man became mad after the affair. Graham Greene has been one of my favorite authors whose works I continue to re-read. He always reminds me, or at least associates my thoughts to Fitzgerald. Their writings are both elegant and contemplative, often revolving around religious ponderings and human values. It’s time to re-read this book and a few others of Greene. @ charley: the switching focus did bug me, mostly because he switched to something I was less interested in! Like you, I tend not to enjoy extended discussions on religion… and this one seemed very much to suggest that lives are empty without God and that religion is needed in order to be something more than an angry shell. Meh. @ Eva: I’m not sure how I would have felt about this in highschool! Maybe reading it right after a break up would have helped me connect with it more? @ Matt: Interesting comparison to Fitzgerald. I (shamefully) haven’t read anything by him (but I did take The Great Gatsby out from the library this weekend!) so I can’t say whether it’s apt, but it does intrigue me. I’ll have to keep your thoughts in mind when I do read The Great Gatsby. We have The Quiet American as well as The Power & the Glory (which Tony reviewed earlier), so I’ll probably tackle one of those next. Thanks for the kind comment, Sara! Look forward to hearing more from you in the future! I think you should put this at the top of the pile of things for me to read when i’m at yours!! Fitzgerald, Greene, Maugham are what I consider “old-schooled” authors who have a knack for weaving philosophical inquiries into their stories. As for Fitzgerald, I’ve got Tender is the Night which I’ll read soon. I think the abrupt change of focus would have irked me too. While I don’t mind reading about religion and theology at times, it sounds as though this may not have been integrated with the other elements of the plot very well. I appreciate your insight on this book because I love well written and smooth prose, and now that I know what to expect it may not bother me. 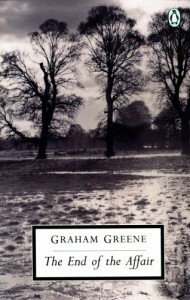 I’ve never read Graham Greene but have been toying with the idea of reading several of his books over the summer – this one sounds like a thought-provoking and well-written book, so it might just fit the bill. If Tony compared Greene to Steinbeck, my favorite writer ever, I know I have to move this up the TBR pile.I can definitely understand how the switching of topics in the second half of the book threw it off. @ Matt: I haven’t read any Fitzgerald or Maugham yet, so I’ll be interested to see how well my appraisals of them match yours (and whether I see any corollaries to Greene). @ verbivore: I think one of the boons for Greene is that his books all appear quite short, and they lend themselves to a single-session read. I’m glad I read this one, and am excited to see what else he has done. @ Vasilly: Even if you don’t feel Greene is a perfect match to Steinbeck (Matt has thrown out some authors he personally feels Greene is a good match for), I think you’ll be happy to have read him regardless. He’s certainly a very strong and engaging writer.